To see this object in the Nichols House Museum online collection, search for 1961.161 here. Look closely at this piece of needlework embroidery. At first glance, it is a depressing scene. A young woman grieves for her siblings —Thomas (10 days old), Lucy (4 years, 8 months), and Abiel (6 weeks). However, to early nineteenth-century eyes, this piece was much more than a reminder of human mortality. [i] Although the artist is anonymous, this advanced needlework offers insight into early nineteenth-century American society, including the education available to women, patriotism in the new country, and even how local economies were affected by female schools in their communities. The young woman who made this piece likely attended a school where she learned fancy, decorative embroidery. Around 1800, many female schools opened around the country to teach well-to-do young women music, painting, and embroidery alongside literature, geography, and other subjects (depending on the school teacher’s curriculum). Creating a needlework picture, such as this one, showcased the student’s skill and patience with a needle and thread — not only with basic stitches, but with fancy embroidery, too. [ii] She would be well-prepared to decorate her future home’s textiles and family’s clothing. Proud parents hung their daughters’ schoolwork in the parlor, signaling to visitors (and potential suitors) that the family was prosperous enough to send their daughter for extra schooling. [vi] The family also showcased their daughter’s skill, emphasizing the importance of education in their lives. The skillful embroidery of this piece is its central achievement. However, there is more here than embroidery, and more than one set of hands. Before the embroidery was completed, the pattern was initially drawn, painted, or printed onto the cloth, and student and teacher worked on the design and color choices. After the needlework was completed, other artisans helped to finish the piece. 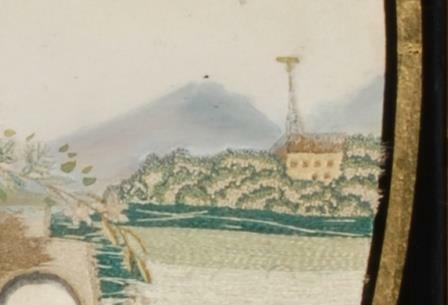 A local portrait painter likely added the painted background, face, and floral details after the embroidery was finished, as seen by the blue paint on the stitched windmill and roof in the lower left corner. The frame was also made especially for the piece by a professional framer. 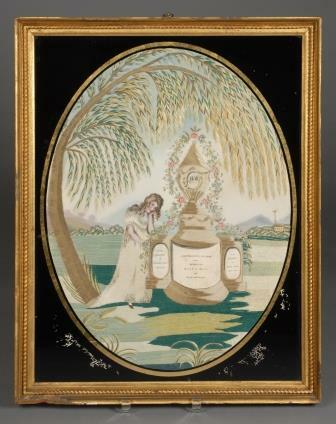 This popular style of a gilded frame with black and gold reverse-glass painting highlighted the light colors of the needlework. Because its production involved purchasing silk threads from the store and hiring painters and framers as well, this one needlework hints at the school’s centrality in its local economy. And of course, the parents had to pay extra for the project’s materials and labor! Overall, this piece is much more than a memorial to the untimely passing of the May children. It exemplifies a time in American history when needlework was at the intersection of female education, patriotism, and community. [i] Betty Ring. Girlhood Embroidery: American Samplers and Pictorial Needlework 1650-1850. Alfred A. Knopf: New York, 1993. 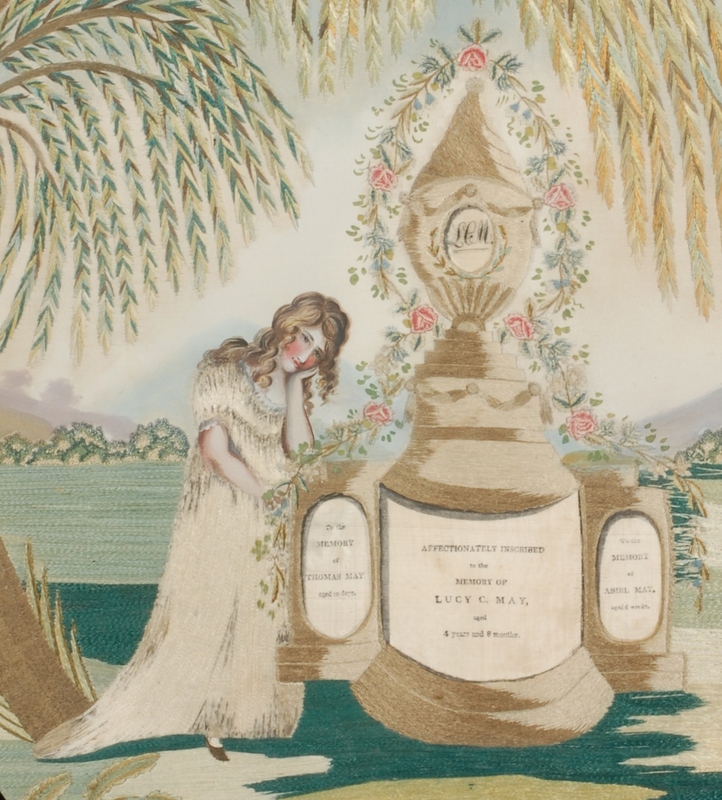 “The majority [of mourning needlework pictures] appear to have been made as a record and a decoration, rather than an expression of current grief, and they were the result of fashion rather than melancholy.” 21. [vi] To see the type of Federal-era rooms needlework like this would inhabit, check out the Metropolitan Museum of Art’s article and pictures: http://www.metmuseum.org/toah/hd/fede/hd_fede.htm.